Hello and welcome. I'm back here today sharing my DT inspiration for the blog challenge over at That's Crafty. Yes it's blog challenge time again and the theme for this fortnight is Rustica. Your project must contain rust effects. Well mine contains rather a lot I think but it was all good fun, especially when it turns you to drink because you want the bottle lol. No, all joking aside, I did save this bottle a while back, as I do many things as it's such a fab shape and I had this sort of thing in mind for it. Anyway that's enough chat. Come and join in the fun and you could be in with the chance of winning that £20 gift voucher to spend at That's Crafty. You can see my project HERE along with all the other amazing projects from the rest of the design team. Disaronno bottle.That's Crafty Black Gesso. PaperArtsy fresco finish chalk acrylics...Bora Bora, White Fire, Lavender, Tangerine Twist, and Cherry Red. Cosmic Shimmer Paint...Scarlet Sunset, Orange Gold, Jade Mint and Purple Violet. LuminArte Paint...Iridescent Red and Iridescent Violet. Spellbinders die...Seth Apter Drip Drop. That's Crafty Dinky Stencil...Distressed Harlequin background. Pentart Rust Effect Regents Kit. Glue Gel...That's Crafty multi purpose craft adhesive pen. I began by giving the bottle a coat of black gesso. I Cut 5 layers of black card with the die and glued these together to give a good depth. This was then glued to the front of the bottle. Then sponge on the Bora Bora paint, covering the whole bottle. Now take the White Fire and dry brush this over parts of the bottle. 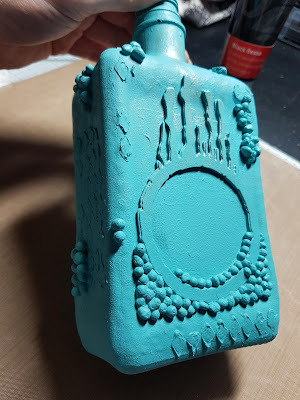 Using the dinky stencil and grunge paste, apply to areas of the bottle. 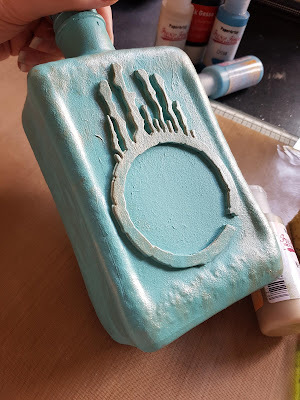 Once this is dry, add the art stones using the all purpose adhesive to areas of the bottle and also in the gap under the die to fill in. Once dry, go over with the Bora Bora. Once dry, go over again with the white fire using a dry brush Now comes the lengthy part. Adding the rust elements. This is best done in sections allowing it to dry thoroughly before adding more. This takes a while to dry so over a few nights I added parts and allowed to dry over night. To do this I applied gel medium on the areas to be rusted and applied the rust powder. Then choose the rust regent colour of your choice and drip it over the rust powder and leave it to do its thing. Carry on with this process once each part is dry until happy. Take the Ancient Heart and apply the Cherry Red and Tangerine Twist, building up the colour until happy. I also added a touch of Bora Bora, mainly around the edge. Once dry I went over with the Cosmic Shimmer paint in matching colours to add the gorgeous pearly sheen. To add a little more yumminess I then added the LuminArte Iridescent paints. 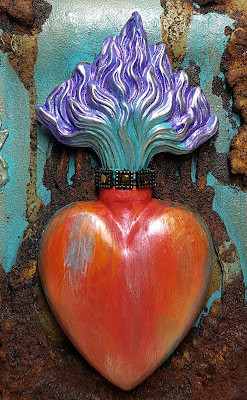 On the part above the heart, paint in the same way as the heart using the Lavender and Bora Bora. Once dry, go over with the Cosmic Shimmer purple violet and Jade Mint. When dry, add the Iridescent Violet. Glue both pieces to the front of the bottle over the die using glue gel. Using my finger, I gently rubbed over the purple top with Treasure Gold. Take the gem strip and add to the top of the heart. Take the word band and rub some Bora Bora across the wording to highlight the words and buff off the excess. Glue this along the bottom of the bottle using glue gel. Tie a piece of metallic thread around the top of the bottle to finish off. 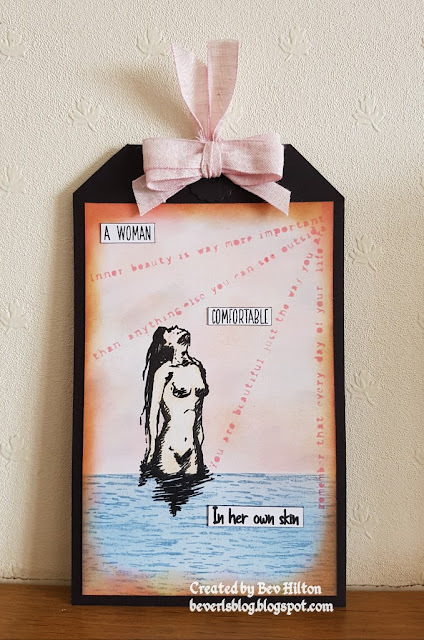 I hope you like it and that it may have given you some inspiration to take away with you and perhaps create something lovely to enter the challenge. You can read the challenge rules HERE. It would be great to see some lovely entries. All for now. Happy crafting and have a fantastic weekend. Hope to see you again soon. Oh my word, this is STUNNING Bev, out of this world rustiness!! This is amazing dear Bev, wow, what an effect you have created, I simply love it , and also the pearls you added to give the rust more texture , it is so fabulous !!! The R&A heart sits perfect on this gorgeous bottle. Hugs to you, and thank you for a wonderful experience !! This is a stunner Bev. 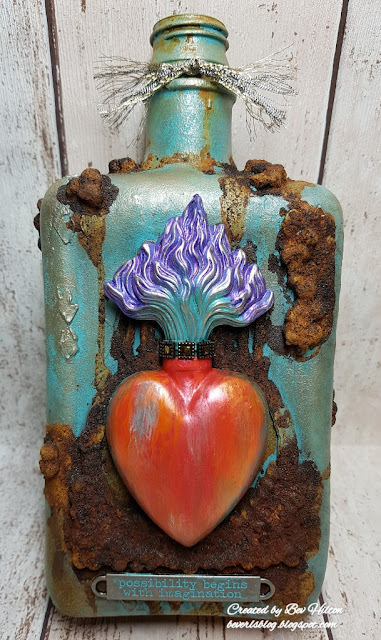 The bottle looks totally amazing and the embellishing with that beautiful heart is just fabulous. Love it! What a fabulous decaying bottle - amazing techniques and effects - this is beyond cool!